Chicken availability in U.S. surpasses pork and beef. In 2013, 57.7 lb. of chicken per person on a boneless, edible basis were available for Americans to eat, compared to 53.6 lb. of beef and 43.4 lb. of pork, according to food availability data from the Economic Research Service (ERS). From 1909 to the early 1940s, chicken availability had been around 10 lb. 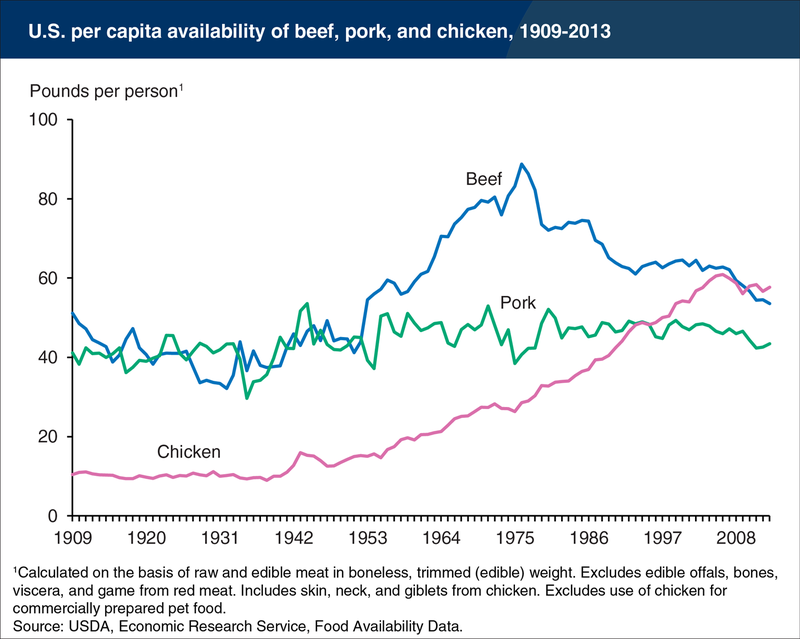 per person per year, while yearly beef and pork availability had ranged from 30 to 50 lb. per person. Chicken began its upward climb in the 1940s as innovations in breeding, mass production and processing made chicken more plentiful, affordable and convenient for the dining-out market and for cooking at home. By 1996, chicken had overtaken pork as the second-most-consumed meat, and in 2010, chicken overtook beef for the number-one spot. Beef availability rose during the second half of the last century, peaking at 88.8 lb. per capita in 1976. Pork availability, which had fallen in 2010 and 2011, was up in 2012 and again in 2013.